This is the last book published by Don and Martha. “….If you accidentally try to order the same song twice from iTunes, you’ll be warned that you already own it. Not because it would be illegal or unethical for Apple to profit from your forgetfulness. There’s a clear busi­ness reason: the leaders of iTunes realize there’s no better way to make you trust them than to be totally honest when you least expect it. 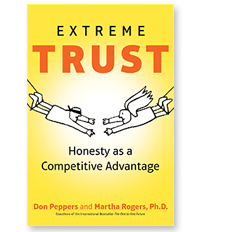 Not so long ago, being reasonably trustworthy was good enough. But soon only the extremely trustworthy will thrive. I truly believe that this book delivers valuable insight regarding the way of doing business in our digital world. Doing things right and doing the right things becomes more and more important. Our customers are the scarcest resource nowadays and every business needs to focus on his existing and future customers.